Social movements have quickly become pre-dominant actors within South Africa’s civil society largely contesting the basis upon which South Africa’s post-apartheid reality has been constructed according to specific policies. 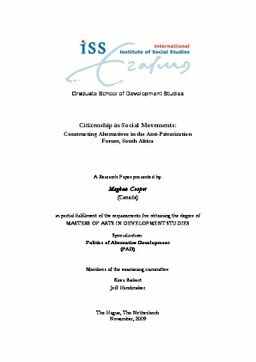 Citizenship is one of the discourses which surround the impacts of said policies and is therefore used as a lens of analysis to how social movements in South Africa are contesting the implications of macro-economic policies and government re-structuring. This paper then explores how social movements construct citizenship and redefine the very notion of the political realm. This is situated in relation to a broader theoretical framework of collective action framing informed by an integrated social constructionist approach and various notions within citizenship discourse. Applicable research to this theoretical understanding was then placed in relation to an evaluation of a prominent social movement, the Anti-Privatisation Forum. Such an examination was done with reference to the historical context and formidable research surrounding the politics of South African social movements. The overarching aim of this paper therefore is to discuss how social movements actively construct citizenship in a way that redefines how the political realm is seen and can be created through an engagement of citizen agency. The outcome is to reignite the meaning of citizenship to potentially understand the concept as a process and lens for citizen lead activism.